Earning through individual planning and innovative ideas in the market is a part of the smart business which is termed as entrepreneurship. Entrepreneurship has more scope of earning profits than a dependent business person combined with the manufacturer or having a superior in the service provided by the individual. Such persons who are renowned as an entrepreneur are also the inspiration for the upcoming generation to follow their ideologies as well as strategies to get success. Moreover, being a developing country, India has a much bigger scope for the entrepreneurship and innovative ideas to get clicked in the market easily. It’s a well-known fact that lots of succeeded intellectuals such as scientists, scholars, and entrepreneurs are produced in India and has gained fame throughout the world due to their intelligence and hard work too. Of all successful legacies of entrepreneurs, young entrepreneurs in India have left their own mark in history forever. Success and achievement story of such young entrepreneurs will surely help the further generation to do much better deeds leaving a stronger impact on the whole world. These young entrepreneurs of India enlisted in the top 10 rankings have achieved impeccable status with their innovative ideas. They are not only the best entrepreneurs but also the younger ones to achieve such success that even a reputed business person took years of their life to reach, their journey to the pinnacle of success is quite interesting too, but their innovative ideas are what that matters. Here is a list of them in no specific order. It is the first name when it comes to the youngest entrepreneurs of India; Ritesh is the founder of OYO rooms that has become the most popular and most utilized application nowadays. Ritesh got the idea of OYO room from Travel stays when he was 18; He developed his way of approach to the customers and has made his own fame in the online business. He is probably one of the youngest and the most successful entrepreneur who has achieved the pinnacle of success faster than any other business person in India. Oyo Rooms is a chain of 2,200 hotels that are currently present in 154 cities across the country. The monthly revenues from these hotels amount to $3.5 mils and have around 1,500 active employees. According to CB Insights, the company will feature to become the unicorn of the start-up industry. For now, it has raised around 125$ million in total from seven investors and in four rounds. Not only that but Ritesh has also claimed many accolades and awards to his name for the marvelous work he is known for including the Business World Young Entrepreneur Award. Ritesh is also spotted addressing entrepreneurial conferences and institutes across the nation. Farrhad is also one of the renowned faces of Indian entrepreneurs whose success story was started at the age of 13. His contribution to the Ted x that is one of the most popular inspirational shows in the social media has gained a lot of attention from all over India. He was the founder of Rockstar media which is a developing media firm of India. He sold his first business idea to a fan for just Rs 25,000 which is used to start the first developing media firm and named it as Rockstar media. The culmination of this global, award-winning firm located in Mumbai, India, has catapulted Acidwalla into young-entrepreneur acclaim, gaining him a conference on CNN at the age of 17, including spots on various paper lists, such as the 25 Internet Success Stories under 25, GenNext Achievers, and India’s Top Twitter Users. Farrhad has remained a highlighted spokesman on the TEDx stage, as well as the junior most guest lecturer at IIT Kharagpur’s year-end entrepreneurship gathering. Farrhad’s most fresh brand-building investment took him to the most incredible of places, the Chenab valley situated in the Jammu region of Jammu and Kashmir, a land in the northernmost geological section of the India subcontinent that for several years was a region of turmoil due to land conflicts. “If you’re slipping and not learning from it, you’re draining your time. You will discover far more from your petite failure than you will from your magnificent success,” says Farrhad. He appointed a senior developer to work for Rockstah Media for an extraordinary sum of money. Safe to say he is the youngest entrepreneurs in India. These siblings are also listed in the future business entrepreneurs of India. Sanjay and Shravan Kumaran developed the Go dimensions which are designed based on providing simplified technological solutions for everything in the digital world. Now Go dimensions is been used by thousands of people across the world. Their success story began from the idea of building the prototype of Oculus Rift in their home from the available resources. For the brother’s the only expense in their investment is to buy gizmos and gadgets and that is where their daddy steps in. “We are a father-funded organisation, which implies we don’t have to go to a VC to toss our ideas, but rather approach our father. He, in turn, admits our plans and purchases the devices,” says Shravan Kumaran. They add that their father, Kumaran Surendran, who is the Associate Vice President at Cognizant Technology Solutions, has remained as a tremendous pillar of support for them. The brothers have gone past apps to create their personal Virtual Reality device and called it GoVR. “Using the headset you can put your phone inside and witness virtual reality. There are a few other merchandises on the market for VR which are really expensive. They have a price tag of Rs. 26,000- Rs. 40,000 per model, but our prototype is available for a mere Rs. 799,” states Sanjay. The first app that the brothers developed was Catch me Cop on the iOS that included catching an absconded prisoner. Other apps on iOS include Color Palette, Emergency Booth, Super Hero Jetpack, Car Racing, Prayer Plant and Alphabets Board. The increasing number of entrepreneurs and investors in India has caught the intelligence of young Indians and with the launch of the Startup India work plan, the country is now gradually developing an ecosystem that is favorable to startups. Tutorial institutes are also now encouraging the spirit of entrepreneurship and management between learners so that they possess the ability to pursue their desire and commence their own ventures. The brothers also make their way to become the youngest entrepreneurs in India. Advait Thakur is the founder and CEO of Apex Infosys India who has started web designing in the age of 9 and worked for the cloud platform and the Google’s Artificial intelligence for many years. He is the youngest Indian programmer and also the youngest entrepreneur who has gained popularity all over the world with Apex Infosys India. At present Advait is working for solving some major problems of India by using IOT. The adolescent CEO was born on February 17, 2003, in Mumbai and is presently a student of DAV Public School, New Panvel in Mumbai. He was very distinct from the rest of his companions during his youth and forever stood out from the pack. He acquired an interest in everything, especially in computers at a really young age. In fact, he designed and developed his own website when he was a 4th standard student or when he was 9 years in age. Moreover, Thakur also does humanitarian practice. Through Advait’s high school times, he has also served for the NGOs like Satish Haware Divyang Centre & Beautiful Tomorrow and assisted them in gaining an extra public attendance through the online program by giving them digital marketing assistance for free. Though his first patron was a Financial Company for whom he developed a Web Portal and implemented co-operation in the fields of SMO, SEO, etc, and earned his first revenue making him Young Internet Entrepreneur. Without an adumbration of a dilemma, India requires such young minds, who are probably powerful enough to navigate the young age to the future of technology. The tale of Advait Thakur is something that can be told to everyone, particularly to the youngsters. He is a criterion that if one’s power and struggles are optimized the soundest way, he will, for sure, reach the pinnacle of achievement. if one is prepared and determined towards his goal, he is predetermined to surmount the world, as quickly as young CEO Advait Thakur did. The name of Arjun comes under the most ambitious entrepreneur and is also the founder of most renowned startups The Bizden and the Fuelbrite.com. He has also contributed his part for the Canvs+ which is the advanced upcoming visual project management. He used social media and the web-based application such as LinkedIn to meet with the entrepreneurs and gathered the best of them for his startups. Approaching the experienced entrepreneurs through LinkedIn made him one of the youngest entrepreneurs of India. At the time where the maximum of the boy’s outlook towards life is unpredictable and erratic, Arjun Rai on the other side was more defined and determined. When children of his age were occupied playing video games, he planned a parking sale and made his first drawing, which in itself expresses in extents about his attitude towards life. Not all children have the enthusiasm for doing complex things when others listen to their parents some have the determination to think beyond the common and explicate the world their potential to succeed. Since high school, Arjun has been an excellent net worker; he also worked on a few startups and projects of his own throughout the time. He became COO of a fast-growing online promotion company in 2010 but left it and is now looking to start up with Odysseys Ads providing solutions for the 21st-century distributors/retailers. The time he was finishing with New York Institute of Technology he had previously started two flourishing startups, The BizDen, and FuelBrite.com. After interning with a PR organisation in 2012, Arjun soon realized the need to stake in the tech space and established roots financing to create a startup which is one of the leaders in visual project administration called Canvs+. Age was never an obstruction for this mastermind as he always thought the desire for doing something only encourages you to accomplish it. Trishneet Arora is the founder and CEO of TAC Security Solutions and was enlisted among the Top 50 most influential young entrepreneurs of India. He is also one of ethical hackers of India and has started the TAC security solutions when he was just 19 which has been one of the best security solutions in India with a massive number of clients. Trishneet defined hacking in most classic ways as an art and can be achieved by only a few and if not nurtured well it could be terrified too. A school dropout from Chandigarh is now a cyber security specialist and has made it to the Forbes ‘30 under 30’ Asia 2018 list. Trishneet Arora, 25, proceeded on the way to the Enterprise Technology division of the list which is packed with creators and disruptors who are re-creating and organizing their businesses and growing Asia for the better. Trishneet is a cyber security specialist, an architect and the originator and chief executive officer (CEO) of TAC Security; a cyber-security company from Mohali, abutting Chandigarh. It offers vulnerability evaluation and infiltration measurement for companies, recognizing flaws in their cyber security. In 2017, Trishneet was placed among the 50 Most Influential Young Indians by GQ Magazine. He has obtained funding from investor Vijay Kedia including support from retired vice-president of IBM, William May. Trishneet had an inclination towards technology quite early; in the age eight he undid his father’s computer and could not fix it. When his father took the computer to a technician, Trishneet followed him and witnessed the work. The computer took 15 minutes to get back its normal life. This overpowered him and drove him towards making an attempt to learn software and hardware. Hacking is a craft that Trishneet obtained on his own. He first made an effort to hack into his dad’s computer back in 2007. The victory then inspired him to take up hacking ethically later. He also penned a book, The Hacking Era, distributed in 2013. Making him, the youngest entrepreneurs in India. Kavita Shukla is the founder of the company Fenugreen and it is said that the innovative idea of Kavita cost just as much as the science project of the school students but has gained a lot of popularity all over India. She invented a transformative fresh paper that is spice infused and can keep fruits and vegetables fresh for a long time fighting against bacterial and fungal growth on it. This paper is now available in nearly every stores of India. She came up with the concept of soaking the seasonings into layers of paper; she even designed her own paper combination, using $25 worth of supplies from a craft shop. Now Fenugreen, based in Columbia, Maryland, produces a result that is at once natural and conceivably transformative: spice-infused FreshPaper, which retains food uncontaminated by restraining fungal and bacterial growth. Shukla sculptured on her outcome during high school and college days, funding her own money all the way. At 17, she spent $1,500 which she won at science fairs to receive a patent, saving on judicial fees by registering for and supporting it herself. But when she got to Harvard, her struggles to build a global philanthropic couldn’t get sufficient attention from dormant contributors and eventually showed, well, empty. She aspired to build an industrial facility to get FreshPaper to the growing world. As she couldn’t find funding for a large-scale philanthropic, in 2011 she chose to try bootstrapping a regional for-profit. Shukla and her co-founder, Swaroop Samant, spent about $150 on seasonings and papermaking supplies to make a thousand sheets of FreshPaper in the pantry of Shukla’s studio home. They provided the first specimens to merchants at a farmers market down the street and the rest is history as you know it. She also comes under the top 10 entrepreneurs in India. Siddharth is one of the most known philosophers and designers who have spoken in many college events. He has started the creativity in speaking and in philosophy in the age of 11 and since then known for his best motivation speech for the college students of India. He started an online magazine named as Friendz which is doing quite well online. By the 11th grade, he had attained important knowledge in designing and developing websites. He also began working on several freelancing projects and in the manner selected few people. It was throughout these years that he had the plan of dropping off a year before entering the college. He did confront many guides on his smart decision. But last, of all he did what he intended to do. He says that he knew college won’t explain him anything, so why should he join? Just to catch the other mice in the race. Rather, he went for dropping a year, at the end of which everything actually landed at right places for Siddharth. During this one year he served a few startups, came across several interesting individuals, disappointed with a few things, but overall he acquired experience from everything. After a year of sampling with various projects, he went for an Arts college to proceed with his graduation. But things didn’t turn out precisely as he had planned. There was no wrong with the college but in a way, it was hampering his startup career. Although he did learn a lot from different individuals, he stuck to his dream to do something of his own. The 9 to 5 program of the college provided him with a very short time to fiddle with his enthusiasms, ultimately, dropping out was the only solution. Attuning on to his web-making skills he began Web Mutiny, with a friend. Commonly, they meant to build and interpret good design and theme problems. With the course of time, as amazing events unfolded for him, he resigned Web Mutiny to join Instamojo in Mumbai. Different platforms, but he still works on his enthusiasm. Living his fantasies as per his own choice, this is the reason for ‘King’ Sidharth. Pranav is the CEO of Neuro-insight Company which uses the advanced technology that was once introduced to Dr. Richard Silberstein too. This is one of the most advanced brains mapping technology that was aimed at making best television Ads. At the age of 31, Pranav became the CEO of Neuro-insight Company at the age of 25 that shocked every other entrepreneur of India. He is also named in the youngest entrepreneurs of India. Pranav Yadav did his education in India and Singapore. Pranav finished graduation from Carleton College. He read Physics, Mathematics and Economics there. Before entering in full-time association with Neuro-Insight, Pranav started serving at the New York office of ReD Associates. At ReD, Pranav attained a great exposure across enterprises and the purposes. Prior to ReD Associates, Pranav was working for elite Structured Equity Derivatives group at Goldman Sachs, New York. Sreelakshmi Suresh is one of the renowned web designers who has developed the website at the age of 10 and has received many national and international awards. At present, she is running over 100 websites for many renowned institutions as well as reputed organizations of India. The Association of American Webmasters acknowledged her by presenting their membership along with their special award for superiority in web design, the Gold Web Award. She is the single member of the Association of American Webmasters, ever, who is under the age of 18. She is the winner of National Child Award for Outstanding Achievement 2008, the largest award in India for Children established by Govt. of India. She is designated as the Brand Ambassador of InfoGroup; a group of organisations and Director of YGlobes Technologies. Presently she has started her own web designing company eDesign (www.edesign.co.in), wherein she is the CEO, making her the youngest CEO in the World. Now she began another company, Online Pixel Traders in cooperation with Cybrosys Techno Solutions Pvt Ltd wherein she along with Mr Sainul Abideen are the Business Partners. Sreelakshmi Suresh is the girl of Adv. Suresh Menon and Mrs Viju Suresh making it to the list of top 10 entrepreneurs in India. A dropout who is now his college’s largest hirer. If high-adrenaline performance is the concrete sign of broadcasting a message, Deepak Ravindran is striking out one loud and clear. The Bengaluru-based startup ‘Lookup’, of Deepak has investors like Twitter co-founder Biz Stone and Infosys’s Kris Gopalakrishnan, was in the closing rounds of completing its newest round of funding. And the CEO and founder of the hyper local texting app, that allows companies to connect with local consumers reports the announcement will be done soon, which by now is perhaps done already. The thought for Lookup hit Ravindran while returning to his hometown of Kasargod, Kerala. With WhatsApp, he saw one requires saving the contact number to initiate a conversation. Once that is finished, you can see each other’s frequently change display pictures, which may generate privacy dilemmas. He approached those with Lookup, guaranteeing consumers do not have to bother about communicating with traders they’ve never met before. The texting application industry has been this 30-year-old successive entrepreneur’s essence of energy, with this being his third attempt in the space. Having an eye on the shifting tech scene, he has metamorphosised the organisation to meet increasing demands. His 2007-launch student startup Innoz was sort of an SMS-based search engine. “It was a time when cell-phones were growing popular. But the internet was still not so well-known. The potential for an offline search engine was massive back then,” says Ravindran. But by 2014, with internet ruling over voice, Ravindran understood the rules had evolved again. To meet the crisis, he chose to blend the two big trends of texts, messaging and apps. Lookup was the result of this mission. Surely another, youngest entrepreneurs of India. It must be fate that India’s ride-hailing high-tech business was founded by someone from Ludhiana, a city best appreciated as one of the world’s biggest production hubs for the ordinary bicycle. For those who meet Bhavish Aggarwal for the first time, his gentle, soft-spoken demeanour is unlikely to forget. Get to identify him a minute more and you will quickly notice his thought, desire and fortitude to stand against all odds. After all, he co-founded Ola at a young age of 25, one of the world’s biggest ride-sharing cab service, estimated it to more than 100 Indian cities where Ola Operates, enabled millions of driver-partners jobs and passengers and is a flag carrier for India’s consumer-tech ecosystem—all by the age of 32. In adding his honors, it’s easy to overlook the efforts he faced while establishing one of India’s most renowned startups. From bootstrapping Ola when Indian user tech was still was taking baby moves to confront administrative barriers and struggling off external contenders, Bhavish has run around the block a few times. By taking his start-up Ola Down Under to Australia, he has assigned it one of the first homegrown tech businesses to meaningfully grow outside the country. This time, he has the wishes and prayers of a billion Indians, including mine and all the others riding his cab. Amir Rao, a video game developer, started Supergiant Games at the young age of 19. He was working for EA Studios and was involved in the development of the Command & Conquer series. 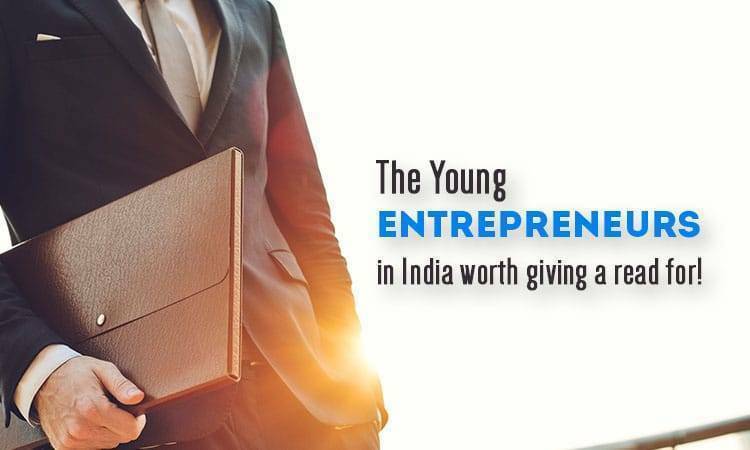 After going through the story of so many young entrepreneurs in India, it surely indicates that you don’t require a degree from a top-notch college, grad school or university to claim your fame. It is in your thoughts that whether you can make your way to the top or fall in the rat race. All the youngest entrepreneur in India had their ups and downs in making their way to the summit. What pushed them further was their sheer dedication to chasing their dreams and making them a reality. Talent doesn’t come and say you hi at the time of your birth, even efforts from your side will take you one step ahead in what you are looking for, it is you at the end to make a name in the hall of fame for yourself. The top 10 entrepreneurs in India mentioned in this article, have made the country proud with their achievements. They have inspired the youth of the country to do something that intern assist the overall growth, accelerate employment and after all make our country worth remembering for.